George Edward: b 1839 Wigan; 1861 with aunt; 1871 surgeon FRCS at Liverpool Mt Pleasant; founded the St Paul's Eye and Ear Hospital as a private charity; 1881 surgeon oculist; died 15th Feb 1909 in Las Palmas after going there because of his health. marr. Louisa Nimmo - six children. John Scarisbrick: b 1842 Wigan. Married Mary Lea 1870 Ormskirk; had five children. 1866 set up as an engineer, previously a leading draughtsman with Haigh Foundry Co. Started Walker Bros with brother Thomas in Queen Street. Changed company name to Pagefield in 1904 when they started manufacturing vehicles. Died 1922 at 15 South Park Crescent, Southport. Mary Alice 'Polly': born 1843 Wigan. in 1851 kept a school in Edinburgh. In 1891 a teacher of English. She married Thomas Syme Henderson in 1868 in Southport. They had four children. Thomas Ascroft: b 1845 Wigan. In 1869 joined brother in business. In 1881 was a mining engineer living with aunt. 1887 married Mary Gibson Johnson in Southport; had six children. Edwin Robert: born 1849 Wigan. Married Mary Francois Field; had two children. Lived in Southport as mechanical engineer. Died 1923. James Howard 'Jim': born 1849 Wigan. In 1871 he was a colliery manager living with brother Thomas, aunt and Edward. In 1874 married Anne 'Annie' Wigan Barton. In 1881 he was living at Thornhill, Standish. In 1891 he was a mining engineer. He died 5 Mar 1918 and left estate of £22, 368. There is a record of James and Jane Walker dismissed from the church at Tottesbank because they had removed themselves to Wigan. In 1841 he was in Wigan as a shoemaker. There is an account of how he had ruined himself in Cartmel by buidling a church which was then possessed by Lord Lonsdale. The firm, Walker Bros, founded by his sons, built the ventilation system for the Mersey Tunnel. James Walker died circa 1867. It is possible that James's parents were George Walker and Margaret Beck. George was born 1766 Cartmel and married Margaret Beck 1799 . Jane Ascroft's ancestry is of special interest. Her parents were Thomas Ascroft and Margaret Scarisbrick. Thomas's family were from Wigan. Margaret's family were from Scarisbrick and an aristocratic line that stretched back to the Middle Ages. Thomas Scarisbrick (1502-1530) had married Elizabeth Stanley, daughter of Thomas, 2nd Earl of Derby and Anne Hastings. 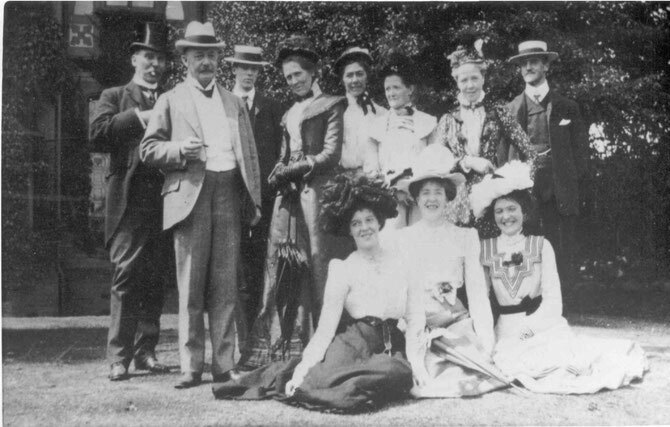 Walker/Barton/Ellis family in 1904: standing l to r James Howard Walker, Thomas Ratcliffe Ellis, Elizabeth Betty Barton, Eva Jane Barton, Annie Wigan Barton, Mary Dean Barton, Humphrey Walker; seated Madge Ellis, Dorothy "Dolly" Ellis, Trixie Walker. The marriage of Mr Thomas Ascroft Walker of the firm of Walker Brothers, iron-founders &c Wigan with Miss Mary Gibson Johnson, eldest daughter of Mr J H Johnson, of Auburn House, Albery road, Southport, was solemnised on Wednesday morning. At Holy Trinity Church, Southport, in the presence of a large congregation. The bridge was attired in a skirt of white plush, with a bodice and train of white satin, while the bridesmaids, of whom there were six, were dressed in cream satin, with woollen fichus and muffs, ornamented with natural flowers. They also displayed beautiful gold brooches, the gift of the bridegroom. The bridesmaids were the Misses Bertha, Ethel, Beatrice, Mabel, and Ruth Johnson, and Miss Rylands of Highfields, Thelwall, near Warrington. Mr Edward Walker, brother of the bridegroom, was best man. The ceremony was performed by the vicar, the Rev C S Hope MA assisted by the Rev C T Porter LL.D. vicar of All Saints, and the bride was given away by her father. As the newly-wedded couple left the sacred edifice, Mr H Hudson F C O the organist, played Mendelssohn’s “The Wedding March”. Breakfast was served to a goodly company at the residence of the bridge’s father, and later in the day the happy pair left Southport for London. The presents were both numerous and valuable, and included, among others, a silver kettle and stand, given by the Mayor and Mayoress of Southport (Mr Councillor and Mrs Unwin), time piece and cruet stand from the workmen employed at the Pagefield Ironworks, Wigan; silver tea service and diamond ring, Mr Johnson; entre dishes, Mrs Johnson; dessert service, Mr and Mrs Walker &c. In the evening a dance, in celebration of the event, was given at Mr Johnson’s residence, when many of the elite of the district were present. On Thursday afternoon, an “At Home” was held, and this also was largely attended. Note: Thomas Ascroft Walker (1845-1933) was the brother of James Howard Walker. We regret to announce the death of Mr Robert Lea Walker of the firm Messrs Walker Bros (Wigan) Limited, which took place suddenly, after a short illness, on Thursday, at Newcastle-on-Tyne, Northumberland. The deceased gentleman, who was about thirty three years of age, was the second son of Mr John Scarisbrick Walker, and resided at 15 Park Crescent, Southport, being constantly in touch with the business in Wigan, which he represented in Scotland and the North of England generally, as well as in the Midlands. He was I fact on his firm’s business in the North when he was suddenly taken ill, and, pneumonia supervening, he died as stated. Mr Walker had just returned from a holiday in Norway, and the new of his sudden untimely death will come as a great shock to his many friends in this district, and to the public generally. The funeral takes place to-day (Saturday) at the Southport Cemetery. It is with regret that we record the death of Mr George Edward Walker FRCS the famous ophthalmic surgeon, of Liverpool, who was a Wigan man, with many local associations, being a brother of Messrs Walker Bros, who own the Pagefield Engineering Works, and of Mt J H Walker, the mining engineer, of Wigan The sad event occurred on Monday at Las Palmas, Canary islands, where the deceased gentleman had gone to sojourn for a short time for reasons of health. Mr Walker was the son of Mr James Walker, a well-known and highly respected tradesman of Wigan more than fifty years ago, and it was at Wigan that Mr Walker was born in the year 1839. he received his early education at the Wigan Grammar School, and he received special mention in the report of the Rev Canon Girdlestone on his examination of the school at midsummer 1852, and the reference to the deceased has a special significance at the present time in view of his distinguished career and his fine work in the science and art of healing. Writing on 7th July 1852 from Deane Vicarage, Bolton-le-Moors, to the trustees of Wigan Grammar School, Canon Girdlestone said he was happy to be able to give a good report of the state in which he found the pupils of the school. “The proficient of several classes, notwithstanding many discouraging circumstances in the various subjects which they brought up, is such as reflects the highest credit on the Headmaster and his assistant. The answers of the Fourth Class were particularly satisfactory, “Canon Girdlestone reported, “and amongst the boys in the class Walker especially distinguished himself.” It is interesting to note that the deceased, who was then thirteen years of age, was the only boy singled out by name for commendation in the report. On leaving Wigan Grammar School Mt Walker prosecuted his studies with great success and at the age of twenty he matriculated at the London University, and then proceeded to University College Hospital, where he obtained his medical tuition. He took his MB with honours in 1861 and qualified as a member of the Royal College of Surgeons in 1863. After holding resident appointments at University College Hospital, the Brompton Consumption Hospital, and the Manchester Royal Infirmary, he was in general practice at Southport for a couple of years, but in 1869 he obtained the Fellowship of the Royal College of Surgeons of England, and studied ophthalmology at the Royal London Ophthalmic Hospital, Moorfields, where he was clinical assistant to Sir William Bowman. It was in 1870 that Mr Walker who was then thirty-one years of age, settled in Liverpool, and began practice as a specialist in diseases of the eye and ear, and the work he did soon made him known beyond the confines of the city, and it was not long before he found it necessary to extend his operations. Busy as he was with private practice, which was rapidly growing, and heavy as were the demands upon his time, yet he felt himself called upon to do something for the poor who were suffering from those diseases of which he had made a special study, and so he took two small rooms in a house in St Paul’s Square, Liverpool, and here people suffering from diseases of the eye and ear received gratuitous treatment,. By reason of his singular skill, Mr Walker became famous throughout the county as an ophthalmic surgeon, and very soon people were coming from far and near to undergo treatment at his hands. Indeed, so rapidly did the work increase that soon, with the help of his father-in-law Mr William Nimmo and others, the whole house was taken and turned into a public charity under the title of St Paul’s Eye and Ear Hospital. To this magnificent work he devoted his life, and he saw the hospital grow from its small beginning to its present position as one of the most notable institutions of its kind in the country. For thirty-eight years Mr Walker did a benevolent work at this institution, and from the beginning, with the exception of brief holidays, he visited the hospital daily until towards the end of last year, when ill-health compelled him to go abroad and he had been staying at Grand Canary where he died as stated on Monday. His demise will be mourned by thousands who have received benefit at his hands. It was only natural that the deceased gentleman should take perhaps more than an ordinary in the cases that came from the Wigan district, and many will remember how he had always a kind word for the patients who had journeyed from his native town to the hospital he had the honour of founding. It is of interest to the public to know that the deceased’s second son, Dr Arthur Walker, will continue his association with the work which his father so nobly began and so successfully carried on at the St Paul’s Eye and Ear Hospital. For many years Mr Walker was a warden of the Church for the Blind, Hardman Street and a member of the council of Liverpool College. In 1870 he married Louise, daughter of Mr Wm Nimmo, of Birkdale, and she, together with six children, mourn his loss. The deceased gentleman was interred at Las Palmas on Tuesday. We regret to announce the sudden death, after a short illness, of Mr George Lea Walker, the youngest and only surviving child of Mr John Scarisbrick Walker, head of the firm of Messrs Walker Bros (Wigan), Limited, Pagefield Ironworks, the sad event taking place at his residence, 15 ?? Crescent, Southport, on Wednesday morning, following an attack of influenza, upon which pneumonia supervened. The deceased gentleman, who was in his forty second year, began his association with Messrs Walker Bros twenty five years ago and on the formation of the business into a limited liability company in 1904, he became the secretary of the company, combining this office at a later date with that of director of the firm. Mr Walker, who was held in the greatest regard by the whole of the employees of Messrs Walker Bros., had many fine qualities of heart and mind. He was a great lover of the fine arts, and took a keen interest in pictures, music and literature. In addition to his great commercial abilities, he was also a very highly skilled engineer, and he took a close and personal interest in the actual engineering work at the Pagefield ironworks. The deceased gentleman leaves a widow and a daughter. His mother, the late Mrs J S Scarisbrick, was, prior to her marriage, Miss Mary Lea, daughter of Mr John Lea, of Wigan. The sympathy of the public will go out to the family in their bereavement. The funeral takes place to-day (Saturday), the interment being at the Southport Cemetery at noon. Death of Mr John Scarisbrick Walker, M.I.C.E. It is with regret that we announce the death of Mr John Scarisbrick Walker, M.I.C.E., the well known Wigan ironmaster, who was the founder of the engineering firm of Messrs Walker Bros (Wigan) Ltd who, owing to ill-health retired from active work in connection with the business some years ago, passed away in his sleep on Wednesday morning, at his residence, 15 Park Crescent, Southport. The deceased gentleman, who was in his 80th year, was a son of Mr James Walker, a well-known and highly respected tradesman of Wigan over 60 years ago. He was born at Wigan, and after receiving his education at the Wigan Grammar School he adopted engineering as a profession and he was the first apprentice of the Haigh Foundry Company after this old Wigan firm was taken over by Messrs. Birley and Thompson. Mr Walker commenced business about the year 1868, and was later joined by his two brothers, Mr T A Walker, JP and Mr E R Walker, JP, the engineering works being first in Queen street, Wigan, adjoining the London and North-Western railway Station. The Pagefield Works were commenced in 1874 and the business was converted into a limited company in 1904. From the commencement of his professional career Mr Walker displayed great initiative in perfecting colliery machinery, particularly in connection with ventilation and air-compressing plant. He became a member of the Institution of mechanical Engineers in 1875, and subsequently in 1895, in recognition of his services to engineering science he was elected a member of the Institution of Civil Engineers. He occupied a prominent position in the engineering world, and was most greatly respected for his abilities. He married the daughter of Mr John Lea, a well known master cotton spinner of Wigan, and had a family of six children, none of whom survive him. Dr George E Walker, FRCS, the famous ophthalmic surgeon, of Liverpool, who died at Las Palmas in February 1909, was an elder brother, and Mr James Howard Walker, MIME, the well known mining engineer, of Wigan, who died in March, 1918, a younger brother of the deceased. The deceased gentleman was highly esteemed for his many good qualities and his death will be a source of regret to all who know him. The funeral takes place to-day (Saturday) the interment being at the Southport Cemetery.